This article was originally published at Reveal. Can stand-up comedy be a platform for investigative journalism? It may seem like an odd question, but that’s exactly what The Center for Investigative Reporting and WFMU, an independent radio station in New Jersey, set out to explore with Toxic Comedy, a series of stand-up comedy shows based on reporting about environmental contamination. Our hunch was that, without reading a word, audiences would walk away knowing a lot more about toxic contamination in New Jersey. And, in the process, they would have burned a significant number of calories through belly-busting laughter. 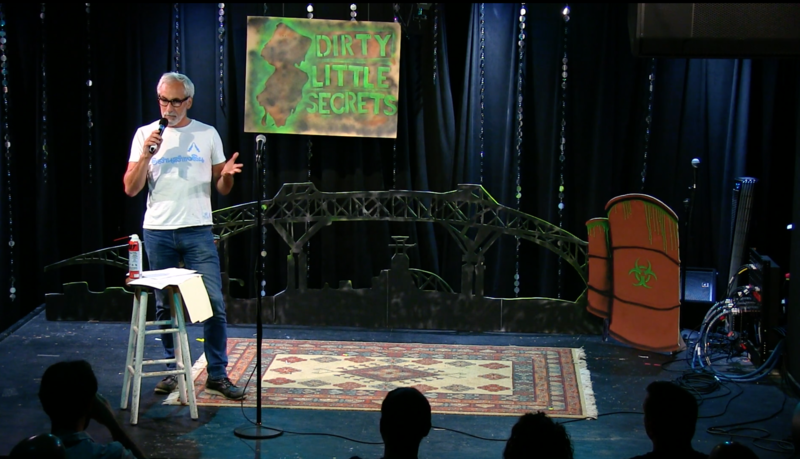 In the spring of 2016, after a year of the Dirty Little Secrets reporting collaboration, CIR partnered with WFMU to make the stand-up comedy dream a reality, billed as the Toxic Comedy World Tour (even the name was a joke – the tour began and ended in Jersey City, New Jersey). To better understand the effect of the comedy show on the audience, I partnered with Caty Borum Chattoo, who directs the Center for Media & Social Impact housed at American University’s School of Communication in Washington, D.C. She has been researching comedy’s ability to influence audiences’ attitudes and perspectives about serious social issues. We conducted audience surveys and interviews with the comedians and reporters. A full report will be published in 2017, but we thought a good way to end 2016 would be to share some positive news about the potential of investigative comedy. 1. Audience members thought the Toxic Comedy show was funny – and enlightening. A whopping 100 percent of those who responded found the show to be both entertaining and informative. Why does this matter? According to Chattoo’s upcoming report, “The Laughter Effect: The [Serious] Role of Comedy in Social Change,” not everyone will seek out serious information about potentially overwhelming social issues, so packaging it up into comedy could be a great idea. 2. People learned something new. All audience members surveyed said they left the show knowing more about toxic contamination than when they arrived. 3. The audience members knew that we wanted them to learn about toxic contamination in New Jersey, and they believed the comedy was based on facts. 4. The audience found the comics to be credible. Four of the five comics were rated as “very credible” by the audience. For people to believe information, it has to come from a credible source, so it is promising that the comics were credible. To extrapolate: An audience can see an entertainment source – like a comedian – as a bona fide source of information and a comedy show as a place to learn something new. 5. Comedy is likely to be shared or discussed. This has serious implications (and seriously exciting) implications for journalists and others trying to engage audiences in complex issues. We know that word of mouth is an important conduit for the spread of information – whether it’s fact-based or not. That audience members reported they were likely to talk to friends and family about this show means the information will spread far beyond the 60 or so people who attended, increasing the impact of this show and the investigative reporting underlying it. Based on our experience collaborating with WFMU and reporters in New York and New Jersey and the feedback from the audience of the Toxic Comedy World Tour, we see ample opportunity for further collaboration between comics and reporters. Keep an eye out for a report we’ll release in early 2017 with more details about the process and impact of the comedy show.